Simply Stunning headpiece as always from Ilda Di Vico - Ascot Hats. 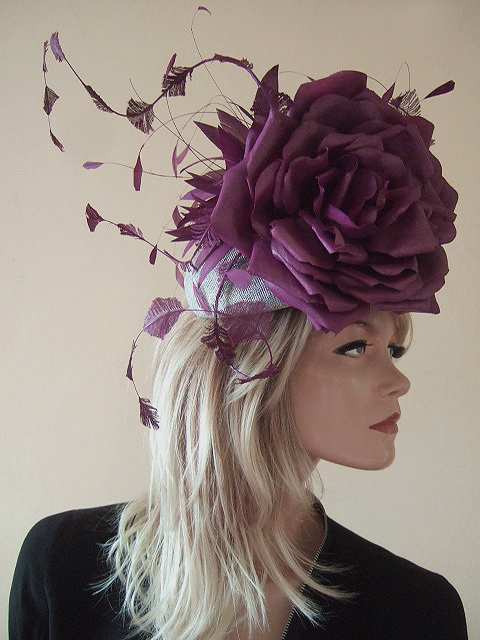 A large skull / pillbox base with a huge rose on the front finished in pearlized dark purple, and a explosion of trimmed ostrich feathers and feather flowers to the rear of the rose. The base sinamay is a uniquely finished silver with metallic silver and gold glittered sheen. A truly stunning piece, with Ildas unique attention to the finish. .
Attaches by elastic under headpiece that wraps around under your hair. Base Measures 6" x 7?. Total Height approx 13.5? to tip of highest ostrich feather.